Flogging Babel: How Much Research Does a Six-Page Story Take? This is a story they tell in the Communes . . . I was asked recently, by someone who was impressed by the depth of reference in "The Mask" (he'd just bought a copy of Tales of Old Earth), how much research had gone into those 1,700 words. The tale-behind-the-tale begins in 1981 when Kim Stanley Robinson published a story called "Venice Drowned." Stan was one of a number of people -- Nancy Kress, Bill Gibson, Pat Cadigan, Jim Kelly, and Bruce Sterling were some of the others -- I considered my peer group. They were my ideal audience, the guys whose admiration I wanted and whose best work I wrote in competition with. Maybe seven years later, as I was preparing for a trip to Italy, Gardner Dozois said to me, "As long as you're going to be going to Venice, Michael, you should write a story called 'Venice Rising,' and sell it to Asimov's." That was one of the many tricks and stratagems that Gardner had for tricking writers into providing first-rate work for the magazine and a good example of why he's such a great editor. I went to Italy and all the while I was in Venice -- a stone dream of a city, unlike any other -- I took notes toward "Venice Rising." I imagined a future in which capitalism had all but been obliterated from the world -- save for one last stronghold. I imagined these new doges as being very much like the old ones -- hard working, colorless, ruthless. I imagined the technologies they'd be selling, and the uses they'd put it to. I lived in that alternate future. When I got home, I continued to create an interesting and detailed world for the story. I worked on it, off and on, for years. I'd chosen the wrong protagonist and, it turned out, the wrong plot. There just wasn't a story there for me, it seemed. So I set the story by, as one must from time to time. Years later, I was reading the Re/Search book on J. G. Ballard, and came across a photo of three potato-shaped white men in chairs with before them a lovely young woman wearing only a bikini bottom and a fish net. The caption explained them as J.G. Ballard, two associates, and a stripper (Miss Tempest Blaze, if I remember correctly) who during during the 1960s put on a series of performances in which she read excerpts from Ballard's works and select medical texts while removing her clothing. It made me feel like a degraded commercial hack, because all I did was write science fiction stories and sell them to Asimov's. So I took all the unused ideation for "Venice Rising" and used it to write a 420-word story titled "The Mask." Using surgical gauze, I then made a life mask of my wife, Marianne Porter. When it dried, I painted the mask white and, cutting the story into strips, pasted "The Mask" over the mask in a sort of demi-mask. 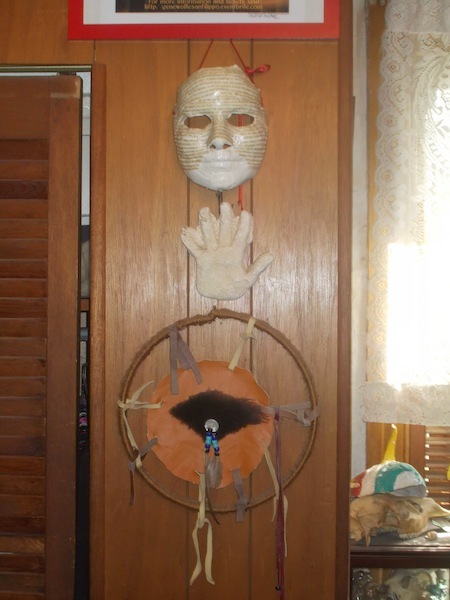 Marianne then punched two holes in the mask, ran a red silk cord through them and hung the mask on the wall. Some time later of course, I expanded the story to seventeen hundred words and sold it to Asimov's. Because I do have to earn a living. So that's all there is to it. From Stan's story to publication in the April, 1994 issue of 'mov's (as Jim Kelly invariably referred to the mag) took a mere thirteen years. I'll leave it as an exercise for the student to work out how much I was earning by the hour. Above: There it is, the original mask. The story I pasted over her has discolored a little over the decades, but she still resides in a place of honor on the wall.